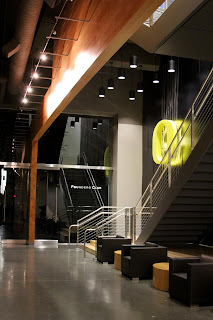 Recently there has been a great deal of construction happening on the University of Oregon campus in Eugene. Since 2009, there have been three major construction projects completed – the John E. Jaqua Academic Center, the Matthew Knight Arena, and the Ford Alumni Center - along with a new addition to the science building, Streisinger Hall. However, these buildings are not open to the public or general student body. Is this new architecture worth the investment? Do they improve campus life for the students? Do they improve life for athletes? 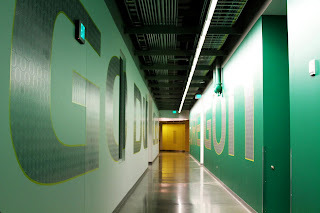 Recently, I was fortunate enough to have a private tour of Matthew Knight Arena, and formulated some answers to the questions that many of the students on campus have about these new edifices. Upon the arena’s conception, there was instant criticism. 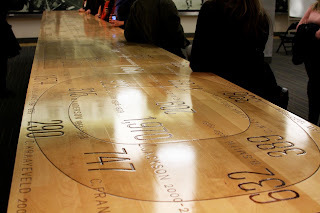 Everything from the $227 million construction costs, to the 65,000-pound center-hung scoreboard (the largest in college sports), to even the etched tree design on the arena floor. However, these immediate concerns are only just the tip of the iceberg – beyond the arena floor, there is a multitude of luxuries that are provided for VIP members and athletes. Touring the facility obviously reveals where the majority of the money was spent – not on the arena floor, exterior, entryway, or the gigantic scoreboard, but on the areas that the majority of the campus will probably never see, the areas dedicated to wealthy, elite donors. The attention to detail around every corner of the interior is apparent – wood interior finishes curved and bowed slightly on the wall adjacent to the staircase giving it a ripple effect, in the VIP room the floor was painted and finished to imitate the original basketball court flooring. Even the tables and other furniture were given a great amount of attention, with important names and numbers etched into the surfaces. Every major large interior space had at least 8 large flat screen TVs, and every private VIP room (including Phil Knight’s suite) sports a large, private, lime green bathroom, an immense flat screen TV, and luxurious furnishings. Even the gyms and hydrotherapy rooms are filled with extravagant items, including a treadmill for injured players to run on while submerged in therapeutic waters. Despite the inherent beauty of the design, is all of this extravagance necessary? For the athletes, the answer would probably be a big “yes.” It is more than likely that the student athletes greatly appreciate all of these fancy amenities, and the arena’s beautiful interiors probably attract more recruits to the University’s athletic programs. On the other hand, the luxury of the VIP rooms for honored guests, might not have been so essential. There was a long hallway of private rooms solely dedicated to the elite of the VIPs, but we were informed that majority of the time, they remain empty. 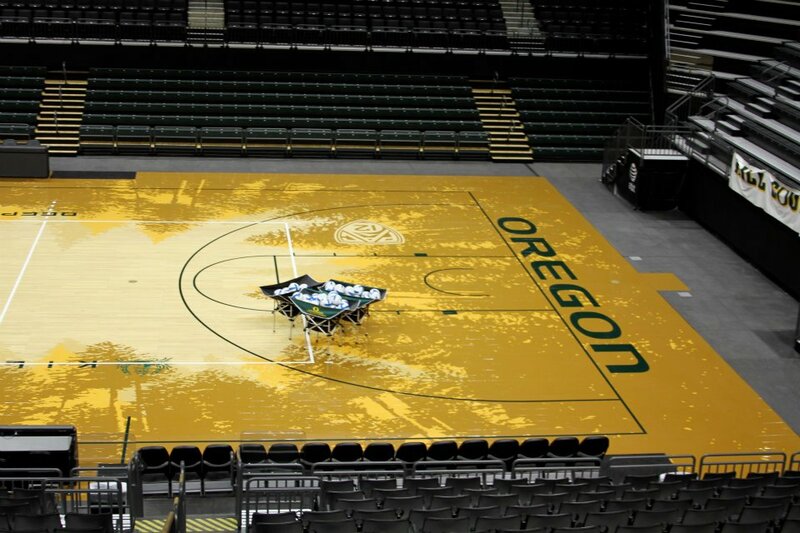 Apparently, even Phil Knight’s own room has been empty for almost the entire time since the arena’s opening. The executive areas are divided into two zones, segregating the “elite” from the “super-elite,” and though both are extremely exquisite in detailing, finishes, and design, there becomes a question of time of usage, and whether or not it truly is necessary to segregate the VIPs in this fashion at all. As for attracting athletes, there is some question as to the new facilities effectiveness. A recent talk show questioned whether all the amenities that are now available on campus truly do attract more, and better athletes. Because that is the true purpose of these facilities: to create a more inviting campus for athletes. The resulting consensus was that no matter how many new facilities Phil Knight may help build on campus, the University of Oregon will not be able to recruit to the same level as teams in other conferences (i.e. – the Big Ten), simply because of the location. The truth is, Eugene itself is not nearly as attractive as other cities, and no amount of shiny new facilities can alter that perception. It is debatable as to whether or not the Jaqua Center and the Matthew Knight Arena actually the goals they were intended for. That being said, the Matthew Knight Arena is a well-detailed space, with great intentions, and considering the large price tag, all that money had to go somewhere. There is truly a feeling that not a single corner or space was left or forgotten by the architects, and the spectacle of the interior space is magnificent. The amount of drama that has been orchestrated shows that with great vision, one can create great spaces. The arena also has become a strong visual landmark, standing tall at the Northeast corner of campus. The Arena does more than students probably originally thought when it comes to improving student life. The arena floor is a flexible space and allows for a multitude of events to take place directly on campus, with easy access for all students. Early on, when the arena first opened, it hosted a charity event called “Clash of the Champions,” where Roger Federer, Raphael Nadal, and Maria Sharapova all played a series of tennis matches. Soon after Elton John graced its stage, and recently there was a performance by Miranda Lambert. These non university events range from concerts and professional sports to monster truck rallies. Although the building was originally intended as a draw for potential student athletes, it has also provided the added benefit of bringing major cultural events to campus and the city. The exterior of the building speaks to the luxury within – its sleek metal and glass finish is indicative of Phil Knight’s desire to be seen as modern and cutting edge. Along with the other new buildings – Jaqua Center, and the Ford Alumni Center – these new, Phil Knight sponsored, additions to campus represent both a disconnect from the history of the campus, as well as the current trend in architecture. As the majority of buildings on campus are clad in brick, the metal and glass edifices feel aloof. The only design trait, which helps alleviate this disconnect in aesthetics, is the proximity of the three buildings to each other, as well as their location on campus. All three are located next to each other on the North East corner of campus. Here they serve as a beacon of modern architecture while transitioning the campus onto a busy commercial strip. With Matthew Knight Arena soaring above most of the surrounding architecture, it is impossible to miss, and has easily become an identifiable landmark. In a way, the design of all three buildings represents the University of Oregon’s overall attitude towards athletes – they are held up on a pedestal, removed, and in a league of their own, separate from the rest of campus. As a draw for athletes, the Matthew Knight Arena might not be as successful as was intended by Phil Knight and the University of Oregon athletics department. Yet, despite that intention, the building does come as an exquisitely detailed interior space, flashing great vision and great architecture despite its great price tag. Beyond this, probably the greatest effect of the arena is that it provides a flexible public space, that is easily accessibility for students and local residents. It successfully anchors the eastern edge of campus and provides a landmark along Franklin Blvd.